Ever since the increase of the estate tax exemption to $5 Million (indexed for inflation in year, making the estate tax exemption $5.45M in 2016), the chatter with the estate tax has simmered. For those who have forgotten about the estate tax, in simple, albeit, incomplete terms, in 2016 you may give away $5.45M to any individual without triggering any tax payable upon your death (in Wisconsin). If you give away more than that, then you have to pay a hefty tax. Only a minuscule number of individuals feel any effect from this rule. With every Presidential election, estate planners far and wide get very excited. Why? Because we become relevant again (granted we should be relevant for everyone, everyday- or at least every 5 years or so). We wave the banner of relevancy because once again we get to talk about the extent to which each Presidential candidate intends to levy your hard-earned cash, and rip it from your (1) cold hands, or (2) poor, helpless child’s hands. At least, that is how my clients explain it to me. The link below explains the different approaches of Clinton and Trump (in a non-partisan manner). Clinton would allow each individual to give $1M to any individual during one’s life, and $3.5M (including the value of life insurance) at death, without indexing the exemption amount for inflation. Amounts over the allowable amount would be taxed at 45%. Trump would eliminate the estate tax entirely (which essentially has already been eliminated for 99.8% of individuals). Feeling the effects of my reinvigorated relevancy, after I read this article (and after writing the above), I needed more information. 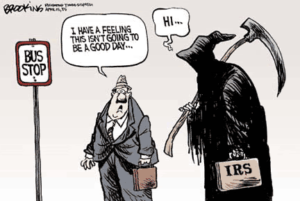 If there is one thing true about the estate tax (called the death tax by some), it really gets a rise out of people. As an estate planner, probably 99% of my clients tell me they want to avoid estate taxes. This is true regardless of party affiliation – I rarely find a Democrat or Republican that wants to freely give their money away to Uncle Sam. At the end of the day, given that only .2% of individuals have a real estate tax problem on a national scale, I am an angel when I let them know how easy that problem is for me to solve. For those that do have taxable estates, there are 6 ways from Sunday for me to maneuver around such taxes, in most cases depending on how early they start the planning process. In conclusion – in the grand scheme of political matters, and even tax matters, the estate tax gets a lot of press (perhaps, even disproportionately). In 2001, the estate tax was $675,000. @110,000 tax returns were filed, @51,000 of those incurred a tax, resulting in $24 billion of tax revenue. In 2003, the estate tax was $1,000,000. 73,128 tax returns were filed (representing 2.52% of the population, see * below), 33,273 of those incurred a tax, resulting in $21 billion of tax revenue. (See, https://www.irs.gov/pub/irs-soi/05estate.pdf. Accessed 8/2/2016). In 2009, the estate tax was $3,500,000. @13,000 tax returns were filed, @6,000 of those incurred a tax, resulting in $14 billion of tax revenue. In 2011, the estate tax was $5,000,000. @10,000 tax returns were filed, @4,000 of those incurred a tax, resulting in $11 billion of tax revenue. Interestingly, in 2011, 119 Wisconsin residents filed estate tax returns, with 46 of Wisc. residents having taxable estates, paying in $488,433. In 2015, the estate tax was $5,430,000. @11,000 tax returns were estimated to have been filed, @5,000 are estimated to have incurred a tax, resulting in an estimated $18 billion of tax revenue. From 2016-2025, under current law, the estate tax will generate less than 1% of the federal revenue over the period. (See, http://www.cbpp.org/research/ten-facts-you-should-know-about-the-federal-estate-tax. Accessed 8/2/2016). I undertook this self-imposed challenge thinking I was going to discover something brilliant – that literally no one had discovered. Then again, I am a lawyer, and when I decided to become a lawyer, I was promised that there would be no math. So, what is my grand conclusion … Based on all these numbers, I am further away from forming an opinion than I was when starting this exercise. If Clinton’s plan was in place then, based on 2009 numbers, only a 1,000 more estates would have to pay more taxes. If Trump’s plan was in place, then 6,000 people would pay less taxes. Now, this is an over simplification beyond imagination because there are so many other variables to their plans – and again, I was told there would be no math in the law. In the grand scheme of things, based on my fuzzy math, if 0.2% are affected now, we are talking about a change of 0.2%-0.00?% in either direction. If you made it all the way through this debauchery of an estate tax exercise, congratulations, and sorry! Perhaps you learned a little, or at least like the comic. Have a great day.